From Wikipedia – The ‘Stone Ship’ or ‘Ship Setting’ was an early burial custom, characteristically Scandinavian but also found in northern Germany and the Baltic states. The grave or cremation burial is surrounded by tightly or loosely fit slabs or stones in the outline of a ship. They are often found in grave fields but sometimes far from any other archeological remains. Ship settings are of varying sizes, some monumental in their proportions. The largest known is the mostly destroyed Jelling stone ship in Denmark which was at least 170 meters long. 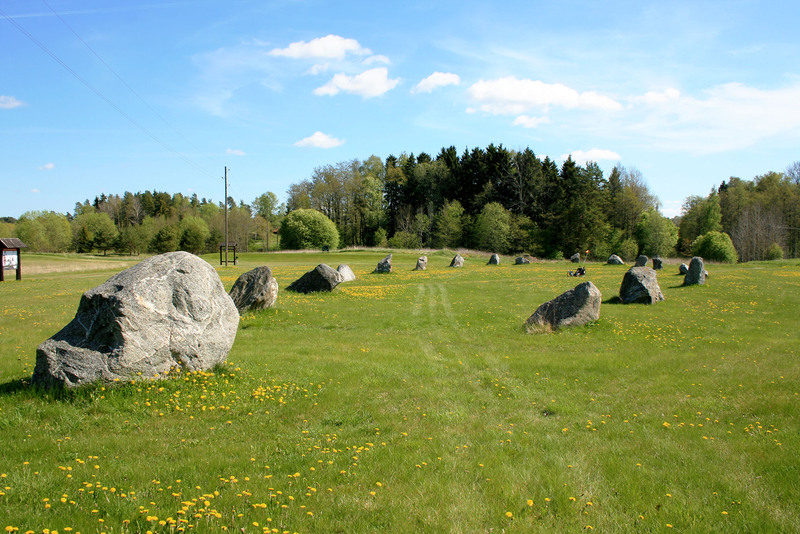 In Sweden, size varies from 67 meters (Ale’s Stones) to only a few meters. Orientation also varies. Inside, they can be cobbled or filled with stones or have raised stones in positions of masts. The illusion of being ships has often been reinforced by larger stones at the ends. Some have an oblique stern. Scattered examples are found in northern Germany and along the coasts of the Baltic states. Excavations have shown they are usually from the latter part of the Nordic Bronze Age (1000 BC – 500 BC in Gotland) or from the Germanic Iron Age, the Vendel Age and the Viking Age. Scholars have suggested both that the stone ship developed out of the desire to send dead off with all he had in life, alternatively that it was specifically associated with the journey to Hel. One puzzling feature is that they are sometimes built at the base of a barrow, enclosing a flat area presumably intended for public ceremonies.